937 North Main Street Date: 1911-1912 Architect: H.J. Klutho Although a number of Klutho's important Prairie School buildings have been demolished, many others have been saved from destruction only to be remodeled beyond recognition. Two such buildings are the Home Telephone Company Building downtown, and the Claude Nolan Cadillac Building. This latter building was a fine Prairie-style design, which nicely complemented the City Engineer's Building across the street. The Claude Nolan Building was constructed of reinforced concrete and had a projecting cornice, large plate glass windows, and a bold interplay of horizontal and vertical lines. Although the drastic remodeling in 1948 completely obscured the original facade (see photo below), there still remain two skylighted garages behind the building that Klutho also designed for Claude Nolan. In the main Nolan showroom building, the architect’s use of reinforced concrete was quite sophisticated and introduced expressive detailing seldom equaled today. The large girders were 14 feet on center with one-way flat slabs spanning between to carry the heavy Cadillacs. As originally constructed, this building went far beyond the glazing usually associated with Prairie School work. 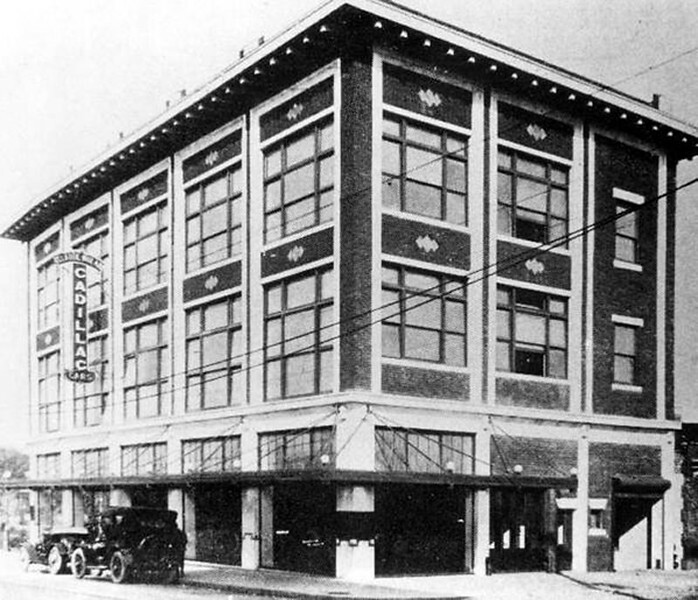 Claude Nolan’s auto showroom and garage building was literally all plate glass; the only solids on the Main Street elevation were the articulated columns and the spandrels. Klutho had achieved the ultimate glass box framed in concrete and delicate brick. The very nature of the building demanded this approach, for it was indeed a jewel box for the display of the aristocrat of American automobiles. A suspended marquee of galvanized iron and glass over the Main Street sidewalk provided cover for pedestrians viewing the auto displays without eliminating natural light. Globe lights occurred at each cable connection to the fascia. When lit at night they must have presented an elegant scene, especially when all of the glass-enclosed upper floors were also radiating light. In 1948 an architect named W.A. Moore, Jr. blatantly destroyed the glass box by removing Klutho’s windows, covering the delicate brick and concrete details with stucco, and removing the cornice and glass canopy. The building today stands as one of many post-World War II, pseudo-modern monstrosities. The Claude Nolan complex occupies a prominent site overlooking Confederate Park and Hogans Creek, for which Klutho did a major rehabilitation project in 1929. 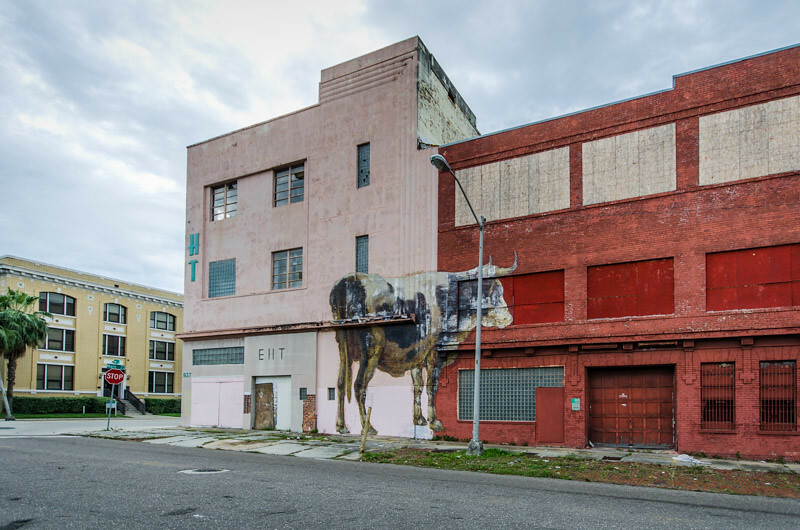 Mr. Claude Nolan, who founded this Cadillac dealership in 1907, was one of this Jacksonville’s most well known innovators. In addition to founding the oldest automobile business in the city, he is also credited with originating the idea of selling automobiles on installments in 1910, a practice that was soon adopted by the entire automotive industry. Also in 1910, he became the first native Floridian to fly over this state in an airplane. In 1928, he became the first person to drive an automobile from Miami to Key West, fifty-four miles of which were on the F.E.C. Railway trestle, before the completion of the highway to Key West. That same year, he conversed on the telephone with Berlin, Germany, becoming the first Floridian to talk directly with Europe.